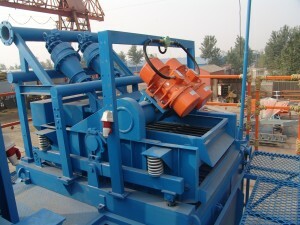 HDD mud desander is a hycdrocyclone desander separator used in Horizontal directional drilling mud system. GN design and manufacture mud desander for HDD mud system and oil gas drilling. Directional drilling (or slant drilling) is the practice of drilling non-vertical wells. It can be broken down into three main groups: Oilfield Directional Drilling, Utility Installation Directional Drilling ( or HDD., Horizontal Directional Drilling, Directional boring) and in-seam directional drilling (Coal-Bed methane).All of the HDD need mud system.and many of them needs mud desanders to be mounted on the mud tank. What is a mud desander? Usually the cone diameter is more than 6″is called Desander, and used as the second-control equipment in drilling operation. We commonly used 10 “and 12” cones desander to separate solid-phase particle size 47-76μm in the drilling mud. A mud desander is a hydrocyclone device that removes large drill solids from the whole mud system. The desander should be located downstream of the shale shakers and vacuum mud degassers, but before the desilters or mud cleaners. A volume of mud is pumped into the wide upper section of the hydrocylone at an angle roughly tangent to its circumference. As the mud flows around and gradually down the inside of the cone shape, solids are separated from the liquid by centrifugal forces. The solids continue around and down until they exit the bottom of the hydrocyclone fluids desander (along with small amounts of liquid) and are discarded. The cleaner and lighter density liquid mud travels up through a vortex in the center of the hydrocyclone, exits through piping at the top of the hydrocyclone and is then routed to the mud tanks and the next mud-cleaning device, usually a desilter. Various size desander and desilter cones are functionally identical, with the size of the cone determining the size of particles the device removes from the mud system. GN design HDD(horizontal directional drilling) mud desanders specificly for GN HDD mud system,and also for replacement of desanders for clients existing mud system.Desander unit that efficiently removes sand and silt-sized particles down to a 70 micron cut. Customized mud desanders are available depending on the volume of the mud being cleaned. Each unit is built on an easily moved compact skid, or without skid, depending on specific application for HDD (horizontal directional drilling) mud cleaning.